What better way to complement a beautiful custom dream home than to surround it with unique and elaborate features? This expansive stamped concrete job located in Midland, Michigan was designed to do just that! 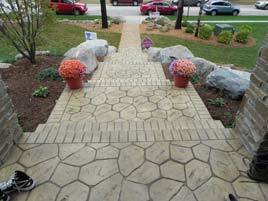 The massive undertaking was tackled by Patrick Maday and his team with Maday Construction Inc. of Saginaw, Michigan. In light of the changes in elevation on the property, Maday Construction had to plan the almost 3300 square feet of stamped concrete and hand-tooled concrete carefully. 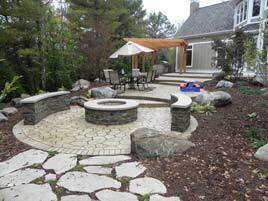 The project was done in phases to accommodate the landscaping in each area. At times, a pump truck was utilized in certain areas not accessible by concrete delivery trucks. 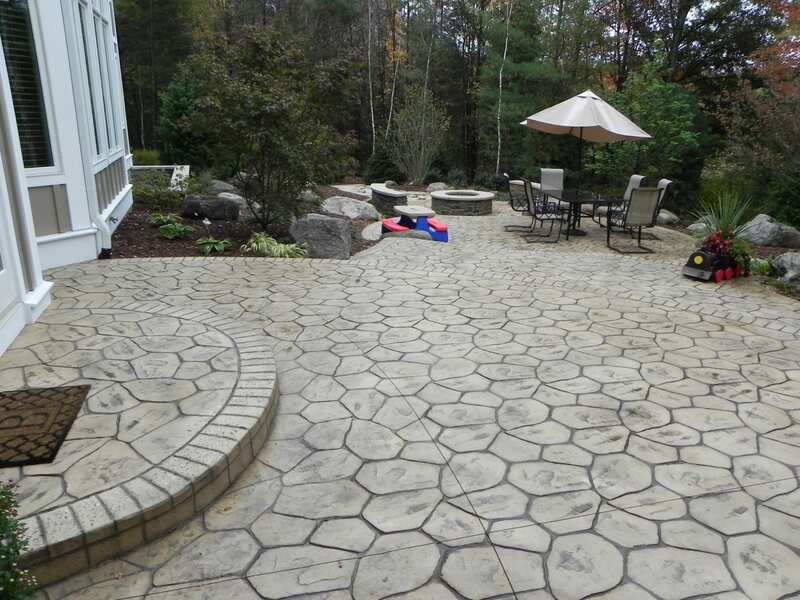 Considering these challenges, this particular stamped concrete project took 20 days over a period of two months to complete! The patios were laid out and poured in seven levels composed of intersecting circles, with each overlap functioning as a step. The layout had to be precise in order to keep true and consistent lines. The layout also incorporated a grill surround and bar area as well as a fire pit with seating walls and several large boulders, all of which had to be worked around. While the rock pattern was stamped into the concrete, the brick borders were made to look as real as possible; they were painstakingly tooled by hand due to being on the perimeter of the circle patios and steps. The eye-catching boulder-flanked entry and walk contains 12 steps that were poured at once. After carefully removing the forms they were stamped and, with meticulous attention from the Maday Construction team, given a hand-tooled brick border to match the patio. 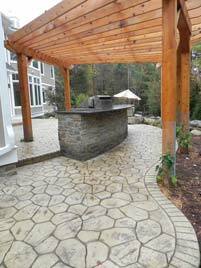 The driveway, too, was accented with a 2 foot rock pattern border and a 40 foot in diameter rock patterned circle in the center. The stamped concrete was pigmented with SureCrete Design Products’ Sahara colored Integral Color and treated with an application of Almond Color Hardener and Brown Powder Release to give depth and variegation to the finished product. Two coats of HS 260 Premium Acrylic Concrete Sealer provide UV protection, waterproofing, and durability for years to come.